Those who know me well are already aware that I keep my AMH stash separate from all my other fabric; this was definitely the right swap for me. Taking Anna Maria's class at QuiltCon in February was infinitely inspiring. Without sounding like a total goofball, I'll just say that it was truly a privilege to be there and learn from her (AND Denyse Schmidt, who was taking the class). My partner (@c_wraestitch) mentioned that she loves warm colors (which is funny because I'm definitely a cool color girl!). Her mosaic showcased orange peels, and I was itching to make some smaller ones. Boom! My decision was made. She says she loves the mini!! For the first time, I quilted my orange peels with my free motion foot in a veiny-leaf pattern. I feel like this extra detail really puts more "oomph" into the mini. Also, I used light gray (Aurifil 2600) on the bottom of the quilt, medium gray in the middle, and dark gray on top. You can see the thread color changes in the picture below. The back of this mini is made up of scraps from my dealings with Anna Maria Horner Feathers (they leave a ton of awesome scraps). I love how you can see the quilted peels! I hope this mini treats Claudia well. I know I'll miss it. Thanks for reading all my mini quilt posts recently! I have a couple more finished projects to share soon and some progress on my two current large quilt projects. Also, the Dream Team (aka the husband, the sister, and me) are working on a project for this blog. And no, we aren't sewing together. :P Stay tuned! Its very pretty! I bet any AMH fan would adore it. Love how you changed around the shade of the threads! It works really well with the fabric gradient. 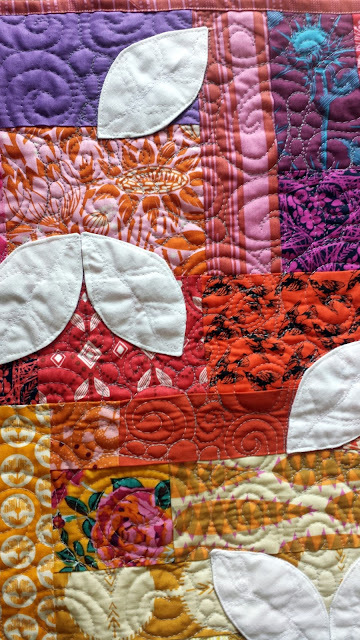 It took me a minute to realize you quilted the orange peels before appliqueing them down and so that is a fun difference between the front and back of the quilt! I really like fun details like changing thread color, and hooray for another successful swap / happy swap partner! I was so taken by Scatter when you first posted it, but I have to admit, its more colorful cousins, like this mini and Soar, have won my heart. You really get to appreciate the AMH fabrics when they are presented in big chunks in the background. I just finished a big applique project and am not looking to sign up for another one in the near future. But this colorful mini? Yes, yes, yes -- this has to go on the to-do list! Just gorgeous! You are inspiring me! I love it! How do you get the white to not show the fabric under through? did you double layer it? This is gorgeous! I love the white orange peels on top of the scrappy colorful foundation! What a lovely mini! I was thinking the same thing as Laura--did you double layer the white orange peels? You had fun making this, and it shows! Looking good. Lovely mini - those AMH fabrics love to party ! Thanks for linking up to #scraptastictuesday - I had to go and check out those other peel quilts too!